Bye week blues have arrived in NFL Week 9. Six teams, each with at least one top player, are not playing this week (Chicago Bears, Green Bay Packers, Detroit Lions, Atlanta Falcons, Buffalo Bills, Tennessee Titans). I’m only going to talk about one player this week, because he was so good in Week 8 he made all other players look irrelevant. I am, of course, talking about Ben Roethlisberger, who completed 40 of 49 passes for a staggering 522 yards and six touchdowns, one short of an NFL game record. Roethlisberger set the Steelers franchise record for yardage, touchdowns, and completions in a single game, and also became the first quarterback in NFL history to throw for 500 yards in two different games. The Colts didn’t know what hit them as Big Ben completed pass after pass with laser precision. Indianapolis’ defense gave up 639 yards of offense to Pittsburgh, the most yards allowed in a single game in franchise history. We have Big Ben ranked at number 10 this week in his matchup against the Ravens, and that’s simply because he probably won’t throw for over 500 yards again. But if Roethlisberger can stay hot, he could see a return to 2009-like territory, when he threw for 4,328 yards and 26 touchdowns. Here are this week’s fantasy rankings for every offensive position except kicker, plus a few players you should get into your lineup for the win. 1. Jeremy Hill, RB, CIN (vs. JAX) – It’s not official, but all signs point to Giovani Bernard sitting this week against the Jaguars. If he does, look for Jeremy Hill to have a nice game on Sunday. The Jaguars have given up 7 catches to opposing running backs on average this season, and Hill will be playing Gio’s part. 2. 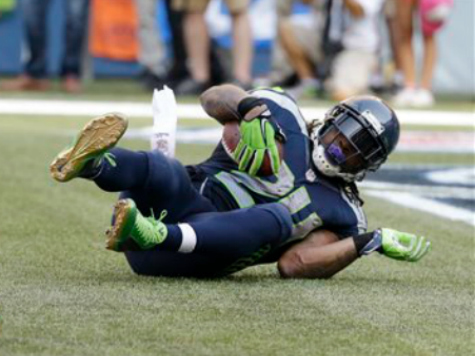 Marshawn Lynch, WR, SEA (vs. OAK) – Lynch owners are worried. He hasn’t had a rushing touchdown since Week 3. He got a receiving TD in Week 5, but has remained silent since. This will be the week he gets it together, against Oakland at home. Make sure he’s leading your lineup. 3. Rueben Randle, WR, NYG (vs. IND) – Randle has had at least 9 targets in each game since Week 3. With Victor Cruz’s injury leaving a big gap in the Giants’ receiver corps, and against an injured Colts secondary this week, he could put up big numbers.